Attestation is a process by which each individual who is planning to go abroad for work,education or business must have to get their original documents attested from the respective embassy. 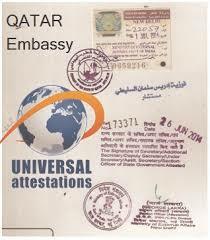 To reach the final legalization of the document by the Embassy, the document has to pass through some mandatory attestation process from various authorized authorities in India.Qatar Certificate Attestation is the act of witnessing a certificate by certified authorities of Qatar with their official seal and signature. Attestation for Qatar is a process which has to be executed on an original document. The attestation confirms that particular certificate has been issued by the respective university and seal and signature on the particular certificate is genuine. To know more about Embassy Attestation please click the below link.